Caja Musical is a veritable panoply of celebratory music. The entire recording is deeply rooted in the folkloric music principally of Argentina, but cuts a rather large swathe through surrounding countries. It is no surprise also that it pays homage to the music of the United States as more and more the music of the US—especially in the idioms of soul and jazz—is informing the music of Latin America and vice versa. Moreover, this younger generation of musicians from both all these countries within the continent are also, with the use of more electric instruments and electronic effects, finding new and more inclusive ways to produce fine blends of today’s music. And this shared love for music is what has helped make Caja Musical one of the more sophisticated recordings that feature such a fine blend of music. The chief architect of the festivities here is the pianist and a fine keyboards player too, Gabriel Palatchi. He is a truly gifted virtuoso pianist and a charming and mature composer. Mr. Palatchi’s music is informed by riotous colour and in the instance of this recording, excellent tone and manner—especially in the use of disparate electric and electronic musical instruments, and in the strategic use of the violin, an instrument that is, sadly ignored in much of modern music. David Macchione surely does justice to his instrument and also attracts much praise for his own virtuosity. Unlike his last album, Mr. Palatchi eschews excessive soloing and is instead a facilitator, who has carefully arranged his music to that effect, so the colour of Latin America informs his music in an authentic manner. Mr. Palatchi also rings in the changes, modernising traditional forms such as Milonga and the Chacarera melding these with the funkier elements of the Jazz and soul idioms. The pianist and composer seems rather well-versed in the sultrier aspects of the Samba and his composition “En La Palmera” is a superb example of this. The other marvelous piece on the album is “Funkeando” an exciting and riotous collision of musics that is driven by excellent work on the Hammond B3 and the brass and woodwinds. The music where the composer pays tribute to his earliest influences is the highlight of this recording. The dancing “Milonga Pa’ Mis Viejos” is absolutely exquisite and Mr. Palatchi’s “Chacarera Salvaje” are not only beautiful compositions, but also provide such exquisite décor for the album that it turns into something so memorable. The music here is authentic and takes the soul deep into the heartland of Argentina. Consequently the listener is magically transported into a place of stately music and a carnival atmosphere all at once. It also bears mention that there are superb musicians that transform this album into a fine caravanserai through the beautiful land of Argentina. Each is a master of his or her own instrument that makes a significant contribution to this fine album. 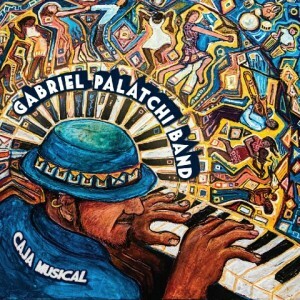 But this is Gabriel Palatchi’s album and he deserves the ultimate credit for putting this musical carnival together. It will be remembered for a long time to come and also bodes well for the pianist future. Track List: Lo Que Se Viene; Argentimba; Chill; En La Palmera; Funkeando; Milonga Pa’ Mis Viejos; Klezmertango; Chacarera Salvaje; Volcan; San Telmo; Purple Blood. Personnel: Gabriel Palatchi: piano, Hammond B3, Fender Rhodes, vocals, Compositions, arrangements; Patricio Resico: bass (1 – 9, 11); Cristian Canatelli: drums (1, 2, 4); Fabian Miodownik: drums (3, 5, 6, 7); Martin Visconti: drums (9, 11); Mario Gusso: drums (8); Carolina Cohen: congas (1, 2); Leonardo Ramella: percussion (4); Titi Gabriel Liñan: guiro, bongo (1, 2, 7); Juan Cruz de Urquiza: trumpet (1, 3, 4); Fernando Padilla: trumpet (1, 2, 4, 5, 9); Martin Rur: alto and baritone saxophones, clarinet (5, 7); Marcela Galvan: alto saxophone and vocals (2, 4); Juan Canosa: trombone and tuba (1 – 5, 9); Gabriel Juncos: flute (1, 4, 8); Walter Castro: bandoneón (6, 7, 10); David Macchione: violin (1, 3, 6, 7, 8, 10); Santiago Rosetto: electric and acoustic guitars (1, 3, 5); Olmo Sosa Yulis: electric guitar (9, 11); Ariel Charec: electronic drums (10); Kafarena: kaoss pad (10); Florencia Vasquez: vocals (4); Mariano Taboada: vocals (2, 11). After graduating in 2008, he packed up his piano and started to travel to expand on his musical studies and experiences. It was in Cuba where he met and studied with several maestros including the master “Chucho” Valdes. He continued his travels to Mexico, where he continued to expand on his musical studies and experience. These travels continue today. Gabriel’s experiences led to the composition and production of his first solo CD entitled “Diario de Viaje” (Travel Diary). On this CD, he has gathered the musical arrangements from over 20 accomplished musicians from Latin America. 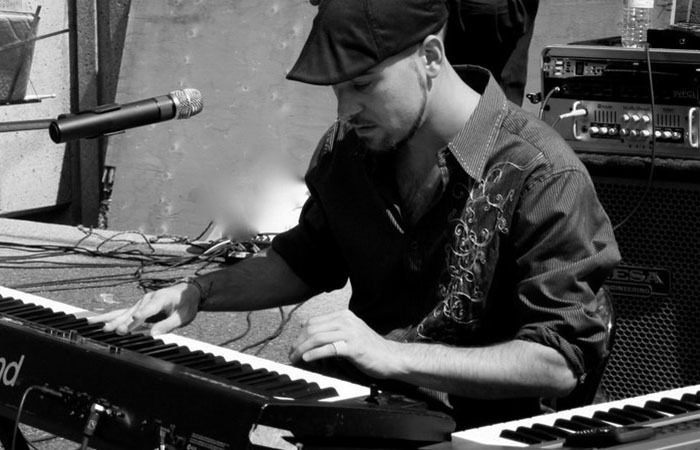 With deep roots in Afro-Cuban and Latin jazz, he has fused together an original sound and style of music that includes Tango, Arabian, Salsa , Funk & Electronic.